Some of his scars look fresh, as if the injury might have been inflicted a week ago. Maybe a month. One of the other scars from the bullet wounds has grown slick and taut, running in a long crevasse down Rani Burnat’s neck, across his abdomen and out his waist. It was 10 years ago that Burnat, 30, was shot 10 times during a parade in Ramallah to protest Israeli prime minister Ariel Sharon’s appearance at the Al Aqsa mosque. As the parade approached a group of soldiers, the bullets began raining. “They wounded and killed us, protestors whose only ammunition was their will,” Burnat said. Burnat survived the shooting, but was left paralyzed from the waist down. He lives in his hometown of Bil’in, a small village in southern Palestine, with his wife and three young daughters (triplets). He is confined to a motorized wheelchair that allows him to roam freely about the village, usually with his camera and one of his daughters on his lap. He’s close to the action, still. 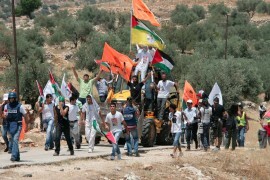 People come from around the world, and the West Bank of Palestine, to participate in the weekly demonstrations against the Israeli occupation of Palestinian territories. It’s on a Saturday when I arrive in Bil’in. After an evening meal with a local family, I walk from the village down a narrow road out of town, among farmers tending their olive trees, and boys playing soccer in the streets. Coming out of this pastoral landscape in an ancient country, I’m suddenly thrust upon the view of Israeli soldiers carrying automatic weapons behind a barbed wire fence. The soldiers stir, and more troops are called in. They arrive quickly in small green jeeps. I realize that from a distance my camera tripod slung over my shoulder might look like a rifle. Within minutes about 20 Israeli soldiers have arrived and move quickly about, preparing for something to happen. Nothing really does. We watch each other through the fence and above us, a tall tower with cameras watches our every move. I could see why the soldiers might be on edge. The day before, hundreds of people made the weekly walk from the local mosque after Friday prayers, to stand with the green, black and red colors of the Palestine flags, and make peace signs with their fingers toward the soldiers. On this day, the pungent smell of tear gas lingers in the air. Even a day after the canisters have been spent, the acrid smell bites at my nostrils. Small black rings of burned out fires dot the brush and grass where phosphorus canisters were hurled the day before by Israeli soldiers. Charcoal streaks run up the trunks of the olive trees, some of which are thousands of years old and have fed families for generations. In his wheelchair Burnat accompanies the weekly demonstrations and each week the result is mostly the same: tear gas lobbed over the fence, local residents and international aid workers scurrying for cover, using branches to beat out the fires that pop up in the underbrush. 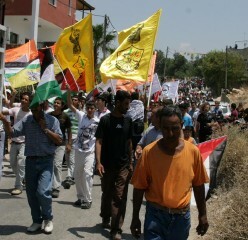 The weekly demonstrations in Bil’in are a symbol of the ongoing struggle between Palestine and Israel. This struggle has been going on for some 65 years, after the United Nations created the State of Israel. Since then, hundreds of thousands of Palestinians have been forced to leave the country, as Israeli occupation has continued to extend much farther into Palestine than was originally agreed upon in the 1948 declaration of the State of Israel following World War II. I spent two weeks in Palestine and Israel this summer, learning about the cultures, people and history of this dramatic place for a documentary film. This was my second opportunity to travel with Sam Neff and Ruth Neff of Whitefish, who organized the trip with Neighbors East and West, a peace outreach group. We’d been to the Islamic Republic of Iran in 2008, a unique and interesting culture — but this journey had a greater sense of urgency and drama. 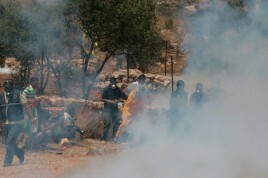 We witnessed how an oppressed and terrified people try to react to the Israeli occupation with nonviolence. For the most part, the Palestinians I interviewed harbor no ill will against the Israelis; they just want their land back. When the British left Palestine in the 1940s, leaving the country open for exploitation, the United Nations cleaved the country in half for Palestine and the new Israel, dividing it neatly by the “Green Line” down the middle. Since then, the Israelis have encroached farther and farther into Palestinian territory, occupying (some say stealing) more and more land. In 2000, as a result of continued violence between the two factions, Israel began installing a huge barricade between itself and the West Bank of Palestine. This formidable wall of concrete, some 50 feet high, snakes circuitously through land that Israel has claimed for itself, dividing families and cultures that were once neighborhoods. Nearly 200 miles long, the wall is the Israelis’ way of controlling who comes and goes into its country. In early morning in Bethlehem, after arriving in Israel at Tel Aviv airport, I watch about 100 men being herded like cattle through a long narrow chute. They marched through a door in the wall, not toward freedom but toward work. With Israel controlling what comes in and out of Palestine, economic conditions have deteriorated to the point where many men must travel each day, through the wall, to work for cheap wages in Israel. At dark, they must return home, through the wall. It is said that the two top countries for Israeli exports are the West Bank and Gaza. When it comes to cheap labor, Palestine is to Israel what Mexico is to the United States. One young Palestinian boy told me the wall was built through his family’s yard and it now separates him from his grandparents. Nonplussed, he painted a window on the wall so that he can imagine seeing his grandparents through it. The wall starkly demarcates economic and social conditions. On one side you see trash heaped in the streets, a rotting stench wafting on the heat of the afternoon; on the other side you see green lawns, swimming pools and soccer pitches. In Hebron, one of the oldest cities in the world, the wall has divided centuries-old neighborhoods. Children on their way to school must pass through Israeli checkpoints, often being detained as their Spiderman backpacks are searched for bombs. When I was filming in Hebron, I captured images of young Jewish soldiers herding children back on to their side of the fence by the muzzles of their automatic weapons. On my journey I found that the historical narrative of the cradle of civilization continually collided with the ongoing conflict between Israel and Palestine. While swimming in the Sea of Galilee (which is actually a lake about half the size of Flathead Lake) I heard what I thought was thunder. This being a cloudless day, that thought made no sense and I soon discovered that what I was hearing was practice bombing runs in the nearby Golan Heights. This contrast haunted me throughout my visit. When I stood in an ancient amphitheater near the village of Jenin military jets roared low overheard in an Israeli show of force. WHEN PALESTINIANS have nowhere else to go, they likely emigrate to nearby Jordan, Syria or Lebanon, or wind up in a refugee camp. These camps are not tent cities as one might imagine, but sprawling city blocks of tall concrete structures run by the United Nations. In Deheishe, nearly 30,000 people live in a concrete maze of buildings about the size of downtown Whitefish. Another refugee camp is in Jenin, site of the 2000 intifada or “uprising” that resulted from peace negotiations breaking down between Palestine and Israel. Just outside the Jenin refugee camp, a stucco wall on a side street is pockmarked with bullet holes. The bullet holes are next to the entrance of the Freedom Theatre, a performing arts organization that was created in 2006 to help children of the refugee neighborhood process their anger and frustration in the aftermath of the Al Aqsa Intifada. When I visited the Freedom Theatre in June, the actors and organizers were dealing with much more recent anger and frustration. Like the bullet wounds on Rani Burnat’s back, the scars were still fresh for “Rawand,” manager of the Freedom Theatre. Their director had been killed two months earlier outside the theatre in April. It was just April 4 when Rawand, several actors and director Juliano Mer Khamis were rehearsing a play. With his 10-month old baby boy fussing, Mer Khamis, 52, decided to take his baby home to rest. Within a few minutes Rawand and the others heard shooting. She told me they ran outside and found Khamis dead in the street, his arms wrapped around his baby. He had been murdered in his car as he was leaving the theatre. His babysitter had been shot also, non-fatally. I was fortunate to be in Jenin for the first performance the Freedom Theatre had given since Mer Khamis’ death. The short play, called “What Else?” examined the lure of Israeli society and the clash among their own Palestinians. It was a raw, visceral performance, made stronger by knowing that after the play most of the young men in the play would be returning home, across the street, to the refugee camp. The performance had helped the theatre company process their grief and anger over Mer Khamis’ death, Rawand said. As she was explaining the positive impact Mer Khamis had on the young men of the Jenin refugee camp, a prop falls offstage. Rawand nearly jumps out of her seat in fright at the noise. “I thought someone was shooting,” she said. The Palestine/Israeli conflict draws thousands of people from around the world to participate in peace movements or non-governmental organizations, such as Defense for Children International, an organization that monitors Palestinian children in Israeli jails. Adam Schiller, of the Gush Shalom peace movement, is one of the many international peace activists in Israel. He has witnessed the struggle between Jews and Arabs since the early 1990s. “It’s like being a long distance runner,” he said in an interview in Tel Aviv. “You always have to try to find the positive aspects in a situation, which is not always easy. From his front porch in Bil’in, Rani Burnat can see illegal Israeli settlements across a wide, dry valley. The wall and some 65 years of conflict separate the settlement from his family. He harbors no ill-will toward the people who have moved into the settlements, many of which are populated with people from around the world who have come home to Israel.